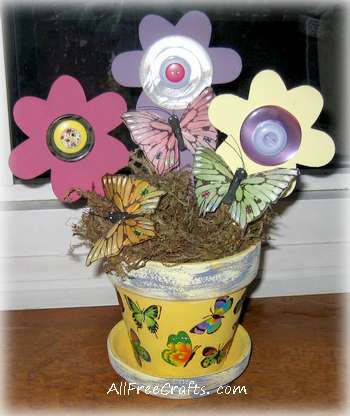 Turn a plain clay pot and saucer into a colorful pot of wooden button flowers and silk or feather butterflies for Mother’s Day. 1. Paint the outside and the rim of the clay pot in yellow craft paint (or the color that you like best). 2. Paint the bottom of the clay saucer, let dry, then turn over and paint the top of the saucer. 3. When the clay pot is fully dried, apply stickers all around the wall of the pot, below the rim, as shown. 4. Cut the florist’s foam into a suitable cone shape and insert into the pot. 5. Paint the wooden flowers with one or two coats of craft paint. Let dry. If you like, decorate the rim of the flower pot with the same colors of paint as the flowers. This could be vertical stripes, random polka dots, or another design. 6. Choose two buttons for the center of a flower. Apply tacky glue to the back of the larger button and set into place in the middle of the flower. Apply tacky glue to the back of the smaller button and set it in the middle of the first button. Set the flower down on a flat surface until the glue has set. Repeat with the rest of the wooden flowers. 7. When the flowers are ready, insert the stems into the florist’s foam. 8. Apply a little tacky glue to the base of the flowers, on top of the florist’s foam and on the rim of the pot. Push a generous bed of dry moss onto the glue to completely cover the florist’s foam. 9. Place one butterfly in front of each flower, inserting the wire stem through the moss and into the foam to secure. 10. Present to Mom for Mother’s Day!